Are you looking for a place to find those groceries you miss so much from your homeland? Below are some locations and helpful substitutes. Please check the comments below for more useful information! Asparagus Kuşkonmaz White is available in jars at most markets. Fresh is available at specialty markets listed below, sometimes, and at a high price. Basil Fesleğen, reyhan Pazar is the best bet, but Real will carry them! Reyhan is purple and Feslegen is small leaves, but both work as a substitute! The markets named below will often carry the green basil we know and love. Butternut Squash Not available. Pumpkin (kabak) Most markets sell a variety of pumpkin when in season. Possible to find at specialty stores for a high price once in a while. Coriander (fresh) Besi Market on Filistin Sok. Cranberries Meteksan, kizilcik, yaban mersini Real, Altinbilek, Peynirci (sometimes). Dried available at some markets and Pazar. Cream Cheese Not available. Labne has been used as a substitute in cheese cakes. Or try ‘Yorsan’ White, beyaz krem peynir, Pinar Beyaz. Most markets. See note below, I found it at 19TL! Hot Sauce Most markets American and Turkish brands available. Jicama Not available. Try yer elmasi. Pazar and most markets when in season. Yer elmasi is techinically Jerusalem Artichoke. But it’s been successfully used as a substitute for jicama, but less sweet. Lime Generally not available Specialty stores below Expect to pay 3-5 TL each. Do not be fooled by the “yesil limon” – it is a green lemon, not a lime. Read more about that here. Oregano Kekik Most markets Be careful, the name kekik is also used for thyme. Read more on that here. Shallots Arpacik Pazar, Metro, Real, some small markets There is disagreement as to whether this is a true shallot or just a small onion. One friend’s suggests using it and rubbing the pan with garlic first. Sour Cream Not available. Try suzme yogurt. Suzme is a bit tart. Try mixing with kaymak. Sweet potato, yam Generally not available Sightings at Besi’s market that is in Filistin Cad and Reşit Galip. Also found around the holidays at Orhan Firinci and the store off of Tunali listed below. Read this post for more info – there is a potato from Hatay that is very similar and can be found. Thyme Kekik Many grocery stores, depending on your area, Be careful that you are not buying Oregano. Availability of dried depends on the city. In Ankara, kekik is usually oregano. Fresh is available at the specialty stores below. Dried thyme is more common in Istanbul and Izmir. Read more on it here. Turkey Hindi Metro, Real Usually in stores around Christmas & New Years. Limited supply for Thanksgiving. Check with your butcher or local market to order one for you. WHERE TO SHOP FOR GROCERIES IN ANKARA? REAL at Bilkent Center is always a good start when it comes to grocery shopping. They carry a large variety of international goodies. Metro is also good, but is operated like a club. There is a wonderful small fruit and veggie store between Tunus Cd. and Tunali Cd, where Bulten Sok. meets Besketar Sok. They always have a variety of fresh herbs including Cilantro. They carry avocado, bluberries, raspberries, sweet potatoes and more specialty items from time to time. The connecting cheese store sells international cheeses including Cheddar and Philadelphia Cream Chesse. They also sell Carr’s wafer crackers. Besi’s Market on Filistin Cad in GOP is another good option for specialty items, as is Orhan Firinci in Cukarambar. Both cater to foreigners. Metro Gros Markt is another great option. They have several stores, the easiest to find is across from Ikea. Linseed, wheat germ, rye flour and other things you could use to make German bread. ‘’Rani’’ Mozarella in salt brine (closest thing to the real stuff from Napoli I’ve had up to date in Turkey, Turkish made, so bearably priced). The whole range of Heinz products. Candy canes as Christmas decoration. Hi there! you need to update your list. You can find limes everywhere dear (real/metro/erzincan mandira,etc.) Sweet potatoes you can find them easily (try orhan firinci, ercincan mandari, metro, etc.). They also sell thyme in many places. Hi Phoenix! Thanks for the info. I will check it out. I am not familiar with orhan firinci or ercincan madari. I do shop at Metro once a month and I have never seen limes or sweet potatoes. I go to Real on occasion, and while I have heard rumors of the presence of both, I haven’t seen them there either. The problem with finding thyme is that both oregano and thyme are called Kekik in Turkish. I am told thyme is here, but so far, I have only found oregano. I will definitely look up both of those stores and email you if I can’t find them. Hi, I moved to Ankara – Bilkent 3 couple month ago and just wanted to share some info. with you. 1) Oregano and Thyme are not called the same in Turkish. There is a difference in latter l. Oregano is – KEKLİK (also called as güveyotu), Thyme is – KEKİK (powdered thyme is called zahter). 2) You can always find Limes in Real at Bilkent Center. Hi Medina, thanks for the info and welcome to the blog! I hope you will keep coming back. I have never seen oregano called keklik, but I will look into it. I have been buying it for two years, mostly at Makro, and it is definitely kekik there. The translation I am seeing for keklik is partridge. I will let you know what I come across! I heard limes are at Real, but they never have them when I go, which is not very often. I did come across them in Kas. The owner of the shop told us that limes are imported – and they were quite pricey! Any idea about soy sauce? Soy sauce should be no problem for you to find. Most markets have a small international section. I have found it in every market in my neighborhood, Cagdas, Makro, M-Jet, etc., as well as Real and Metro. Good luck! Curry pastes, baked beans, and other essentials (!) can be found in Carrefour, even the smaller store down on Tunalı Hilmi Cd. Bacon and other ham / pork products can be found in most Migros stores, and in the big Kipa hypermarkets. Look for the “DIKKAT DOMUZ DIKKAT DOMUZ” warning labels (no joke!) stuck across the shelves! Thanks for the help. We are moving to Ankara soon. My wife is interested in organic foods. Do you have any advise? Hi John, Thanks for reading the blog! Organic foods are becoming more and more common in Ankara. 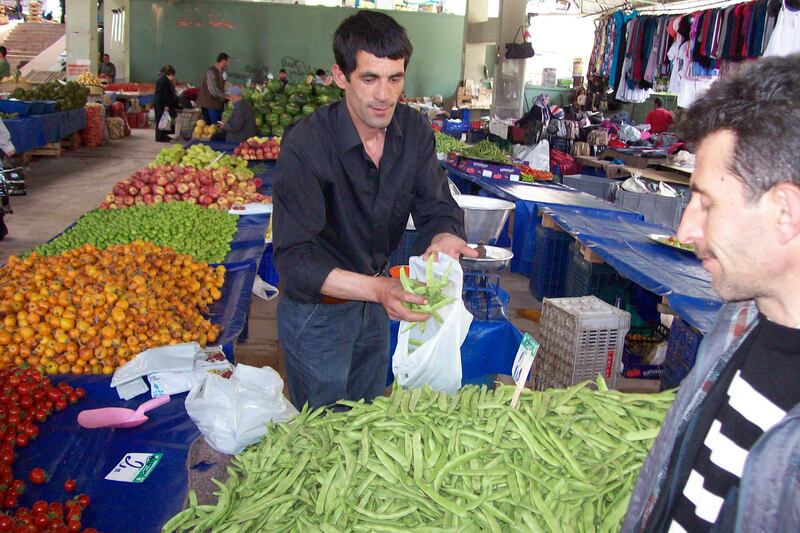 At most pazars, you will often hear a salesman yelling “organik, organik!” The pazar in Ayranci has a regularly scheduled organik pazar on Sundays. http://www.cankaya.bel.tr/oku.php?yazi_id=456. Be careful there though, the entire pazar is not organik. It’s a nice pazar. On the first Sunday of each month they have antiques as well. Me and my boyfriend have recently discovered your blog, looking for where to find maple syrup in Ankara. We can say that your list is very helpful, even for us, Ankara-natives. You can try Deniz Manav on Hosdere Cad. in Yukari Ayranci for all sorts of fruits and veggies, including sweet potato and lime as well as other delicacies. Hope you’re having a good time here in Ankara! Is there a store in Ankara where we can find bacon or ham? My husband has a business trip there soon. Real (Bilkent Shopping Center) sells bacon. It is very expensive. I’ve never seen ham, but there is smoked turkey lunchmeat (fume hindi). Thanks – I’ll send him for a look! I am living in Konya, not too far from Ankara, but I think there is probably a world of difference. I am very distressed that I can’t find decent coffee. It looks and tastes green, and everyone grinds it to powder – like flour. I bought a coffee maker, but if I can’t get good coffee, it’s doing me no good. Also, I like to use a lot of heavy (or whipping) cream. The only cream we can get is shown to be fore coffee, but it is thick and somewhat solid. Can’t make whipped cream out of that. Any ideas? I’m sure we could get to Ankara once in a while for shopping. We are going to look for kekik today. My husband says he knows of it – he is Turkish. I will also look for bay leaves. I asked about celery the other day, and since they carry only produce grown in Turkey, it is not yet in season. Hope I will have some for my turkey stuffing in November. Hi Linda – careful on the kekik. I wrote a whole blog about it. They call both thyme and oregano kekik. I have even seen some in the markets with english written “thyme infused oregano.” Bay leaves are easy to find. Celery was at the pazar in Ayranci last week. They don’t have the same celery. They generally sell only the root. But it is becoming more common to have the stalk, which is much smaller than we are used to. I hear 100.yil pazar usually has it too. I have changed my stuffing recipe. But there are places that sell specialty items especially around Thanksgiving. We can even find sweet potatoes! If you are in Ankara, I can share my thyme and sage seeds with you! We bought kekik, called on the package yaprag kekik (thyme leaves). It looks like thyme (very tiny leaves) and smells like thyme, although I haven’t used it yet. Hopefully, we will be moving into our own place next week. We’ve been living with my mother-in-law and brother-in-law, which is a little stressful, as there is an almost total lack of communication (and privacy). So far, things are okay, but I really look forward to our own place. I haven’t tried to look for oregano yet, as I really don’t use it all that often. Today, I’m going to try to find powdered sugar and vanilla. I’m sure I will be successful, but you never know. Also, I bought sage. I thought we would have a lot of trouble over that, but it was in the tea section and is quite good looking, just the way I like it. Another plant that’s easy to grow. We looked at Adese Market at the mall, but they did not have bay leaves. Also, no broccoli. Other markets may have it. That’s great you found some things. Bay leaves are in the stores that sell herbs. I forget the name of those shops. Broccoli is now out of season, so that will be tough. Powdered sugar is here, but it’s not the same. it’s not 10x like we have. if you try to make icing, it will likely be gritty. They don’t have vanilla. They have small packages of vanilya seker. It’s a powder, and I assume sweetish. I bring extract from home. However, at the same store, they do sell vanilla beans. I haven’t used them, but it’s worth trying it. I hear you on living circumstances! Yes, vanilla sugar is sweet, as it is just powdered sugar with pieces of vanilla bean layered in it. I have often made it in the past, since I was previously married to a Hungarian, and many European recipes call for vanilla sugar. It is very easy to make. Just layer pieces of vanilla beans in a container of powdered sugar and let it sit for a while before using it. It is very good. I’m sorry to hear that it is gritty. Perhaps that will have to come in my care package from my daughter, too. The powdered sugar is gritty. I don’t know about the vanilya seker. I refuse to use it. I much prefer pure extract in liquid form. Probably what you have is superfine sugar. In the U.S. it is pretty much used only at bars, because it dissolves quicker than granulated sugar. I do have some European recipes that call for it, but since American granulated sugar is finer than most European sugars (or at least they used to be), American sugar can be used in those recipes. I will see what I can find in the way of powdered sugar, as I haven actually looked for it yet. I did notice in the dictionary that both powdered sugar and superfine sugar are called pudraseker. I may have to have powdered sugar added to my care package, as well. I think that if you have some brandy and put it in a small bottle with pieces of vanilla bean, it will be a workable solution to the vanilla extract problem. We asked about it yesterday, and the guy proudly brought out vanillin, which is, of course, artificial. My dictionary shows oregano as either keklikotu or guveyotu. In England (at least it used to be), our powdered sugar is called icing sugar, and the superfine sugar is called castor sugar. Don’t know if that helps anything, just a little comment. I see that google translator provides those terms too, but I only ever see it sold as kekik in Ankara. I can’t understand British English, lol, but in Turkey, sugar is seker and powdered sugar is pudre seker, as far as I have seen in the stores. This has nothing to do with groceries, but has anyone been to the Bookish Store at Filistin Sokak No.17/A, Gaziosmanpasa? It is an English-language book store that, I believe, has opened fairly recently. I haven’t been, but would love to check it out. There was a store near Tunali that I loved. Last week I found it had closed. I’ve been to Bookish. They have a wide range of books: history, novels, cook books, children’s books. They also carry some magazines and a selection of paper goods. I didn’t ask but I wondered if they could special order books they don’t have in stock. Sounds like my kind of place. I’ll have to get up to Ankara pretty soon. Well, I purchased keklikotu. I do not believe that it is oregano. I looks to me like thyme with pieces of the stem mixed in with it. I could be wrong, but I don’t think so. Yaprak kekik is thyme leaves, but maybe oregano is just not known here. Hello, this website is really helpful. I have been scrolling through the comments and just wanted to say that I have found vanilla extract in Ankara. I have found it in the baking section of both carrefore and çağdaş, usually right next to the baking powder. I love baking and am having a really hard time here, because it is obviously more of an exact science than cooking and inevitably I find myself having to substitute at least one or more ingredients. Anything that calls for buttermilk, whipping cream, heavy cream, powdered sugar etc just never really turns out right. These things are just not the same as in the U.S. I even found myself wondering if the flour is different here as well (this after multiple failed batches of chocolate chip cookies). I have considered following Turkish recipes, however, I really dislike they dry/tasteless cakes that seem to be so prevalent here. I only have one cake and one muffin recipe that consistently turn out well. Anyone else have any baking recipes modified for Turkish ingredients? If so could you please post them. Also, are there any specialty shops that I can buy good bakers chocolate high quality cocoa? Thanks! I tried the Dr. Oetker powdered sugar. It is gritty, just as you say Turkish powdered sugar is. I wanted to stuff some dates with cream cheese mixed with powdered sugar. The sugar just made it more and more like a liquid. My daughter sent me 2 lbs. of powdered sugar. What an angel! The coffee was great, too, from Dunkin’ Donuts. It’s almost gone, but soon I will have a real address, in Polatli, near Ankara, so I will have her send more stuff. Soon it will be Christmas cookie season, so I will need a number of things, not the least of which is green and red sugar! I have found (by eating breakfast at hotels) that Pinar brand Beyaz (white cheese) is very similar to cream cheese. I’m going to buy some as soon as I have a kitchen and will try it for real. I now have friends in Ankara, as I will soon be teaching English in Polatli. Lauren, the elevation may have something to do with it. Ankara is at about 3000 ft. Supposedly that elevation doesn’t do much damage to baking, but you might check into it. I know that 4000 ft. definitely does (that is the elevation of Konya). Besides the aridity of Turkey, the elevation will make things even drier. You might look up high altitude baking. The dryness is important, too. I always wondered why my bread would not turn out when I lived in Phoenix, and why the bread I bought was always so dry and flat. It was the lack of humidity. Once I get into my apartment, I believe that I will always have some water in the oven for moisture. It may or may not help, but worth a try. I know it helps with bread. It’s a good place for meringues! Also, even in the States I almost never had buttermilk on hand, so I always had to make it with about 1/8 cup of vinegar to make 1 cup of sour/buttermilk. It works just as well, but there may be a slight taste difference. Is the vanilla you found pure vanilla extract? I know that I can get vanilla beans, and I can get vanillin (which is artificial), but I have never seen pure vanilla extract. Let us know where you get it. I had my daughter send me a two lb. bag of powdered sugar. The stuff here seems almost granulated and will ruin a recipe that calls for powdered sugar. When I was in Metro Market in Konya, I did see a bag of powdered sugar that seemed softer than the others. I want to buy it and see if it is better than the others. Ladies, did anyone of you manage to find coconut oil in Ankara? I want to add some advice to Lauren’s question about baking. The oven I have is very good at burning things, and I find that I must always use white baking paper, even under glass casserole dishes. Also, one reason why you find Turkish cakes dry is that most of them (in the bakeries, anyway) are made with egg white batter, which is much drier than baking powder batter that contains whole eggs and usually milk. I just bought packages of Dr. Oetker’s Kakao. It is unsweetened cocoa powder. I haven’t used it yet, but I did taste it. It has a slightly different taste from Hersey’s cocoa powder, but I think it will do. It comes in 25 gram packages for trying it out. If you like it, there are larger packages available. I found them at Kipa. I think that the flour is the same here, but the sugar is definitely coarser than U.S. sugar. I finally had some American brown sugar sent over to me. There is brown sugar here, but it is in crystals and just is nowhere near the same as American brown sugar. I did use it in some recipes where it didn’t matter all that much, and just added a little white sugar to go along with it, since it’s not nearly as sweet as American brown sugar. I got some American powdered sugar in a care package and I am in heaven! I find that the gritty powdered sugar is good for dusting and coating things and works really well in that case. So, I will save my good powdered sugar for use in the recipes and the local powdered sugar for the outside of the baked goods. That’s what they use powdered sugar for in Europe, and that’s why it doesn’t dissolve easily. Bokar, I’m trying to think if I have seen coconut oil. Perhaps in Metro Market. I know I haven’t seen it in Kipa. I know that coconut is called Hindistan Cevisi, so I would think it would be called something like that. I just found a wonderful ingredient substitution website. This will save me postage and weight when I travel to the U.S. I originally looked up what to substitute for light corn syrup, so that’s where this link will take you, but there are many ingredients listed along the sides for substitutions. http://frugalliving.about.com/od/makeyourowningredients/qt/Light-Corn-Syrup-Substitute.htm. You will probably have to copy and paste to get to it. I hate it when I’m wrong, but I have to admit that the “thyme” I bought has turned out to be oregano after all. I bought it some time ago, but had not used it until recently. I put it in my stew into which I always put thyme. Well, it wasn’t thyme! Quite a different flavor to my stew, but not terrible. I’ll be in the States in March, and I will buy some thyme. I found this site while looking up on organic/ecoligical grown groceries Ankara. Hard. My husband is Turkish and have an apartment in Ankara City. The times we went to Turkey I found it very hard to find organic produce. But since i love hiking I saw lots and lots of thyme. Here in norway we have quite a variety of thyme on our gardens, most as a very small bushylike (10cm tall) ground covering plant with small leaves and small white-lilac flowers. The ones to buy in pots at supermarkets never survives two months. They have soft stems and big leaves. The ones in my garden have hard kind of dry stems, and i pick the stem and dry the leaves on the stems until i use it. In turkey i found thyme bushes quite alike, but much bigger. In pine firested areas they grow in dry plateus and i believe you could try dig one up and plant in a pot at your terrace. Taste is thyme, texture a little more course than soft stems and big leaves in pots. But one cannot live without thyme! 😉 if you want to use it fresh i would try find a university within agriculture and find out where to get, or how to mix (compost), soil to grow from seeds. I use fresh a lot, but the leaves always become a little dry on the wild type bushes, but same wonderful taste. So, any organic veggie store to trust? I trust less and less..
Hello Lalia and thanks for reading the blog! I am finding store-bought thyme to vary according to area. It’s more common near the Aegean, while oregano is common in Ankara – or the “thyme infused oregano” whatever that means! I have been growing it myself. And I have noticed it being sold at stores like Bauhaus being used in gardens. I also have noticed that those growing it don’t recognize it as the herb, and just use it for its beauty. Lucky me, I know where there is a ton of it growing in Ankara!!! I am planning to go to Ankara for some weeks /few months with our daughter soon. Do you have any advice on finding organic and gmo-free produce? In Norway we have close to zero acceptance of gmo produce, and I would like to keep my daughter away from it. Also the chemical coctails of pesticide residues. … I love to cook from fresh produce, but frozen can do too. Bolkar, I was in a baharat today, looking carefully at everything they had to offer. I saw coconut oil. Not sure if it is food grade or not, but it was there. They also had some natural soaps and oils and other things that one might find in a “health food store” in the States. I will bring herb seeds back with me from the States. I can only have plants in pots on my balcony, but that should be okay for the herbs. I’m sure I will have plenty of extras. You will find sweet potatoes later in the year. 1- in the shop between Tunus and Tunali on Besketar, 2- sometimes at Metro. 3- at Orhan Firinci in Balgat. In the US, coriander is a seed, the leaf is called Cilantro. I’ve seen cilantro here called both kisnis and coriander. 🙂 thanks for the updates! Do you know where I can find vanilla wafers?? Hello, I haven’t seen vanilla wafers. But Petit Beurre are pretty close. They are in every market. Usually this name on one side of the package and the turkish on the other side. I buy Eti’s brand.